The very product you wash with can leave stains when it contacts laundry in concentrated forms. Blue or white stains from liquid or powdered detergents congeal on laundry items when not sufficiently rinsed out or dispersed in the washer because of overloading. Soak the stained items in a vinegar-and-water solution before washing them again in a machine not so packed with dirty laundry. Teach children who do the laundry not to overload the machine. Add 1 cup of vinegar to 1 quart of water in a laundry sink or tub and place the stained item in the solution. Rub the stained area against itself to loosen some of the dried detergent. Let the item sit in the vinegar-and-water solution for up to an hour. If you have a top-loading washing machine, fill the tub with water and the detergent before adding the stained items to it. Set the cycle for a normal wash load. After the load has completed, check for stains. Repeat, if necessary. Some powdered detergents don't completely dissolve in hard water, leaving white powdered streaks on clothing after washing. These streaks may not show up on lighter clothes but make an appearance on darker-colored items. To avoid this, completely dissolve the powdered detergent in top-loading washing machines, filling the tub with water before adding clothes. Use the vinegar-and-water soaking method to remove tough stains. Some powdered detergents don't leave stains but stiffen the laundry in hard-water conditions or leave a detergent residue. When colored fabrics appear faded or you notice increased wear or abrasions on laundered items because of hard water, switch to a liquid detergent instead. Some powdered detergents just don't mix well with hard water. You can also add a laundry water softener agent if you're not willing to give up your favorite brand of powdered detergent. 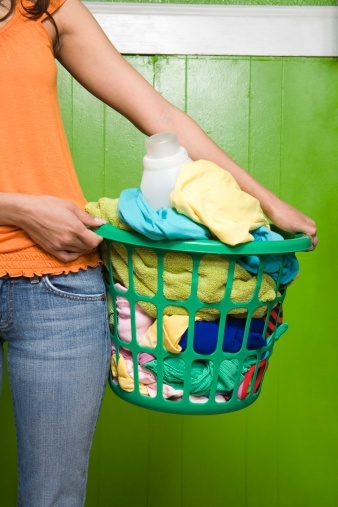 Undispersed fabric softeners can leave a waxy-like feeling on clothes or laundered items as well. For these items, scrub the area with a bar of soap and soft-bristle brush to loosen the jellied fabric softener. After removing as much fabric softener as you can, wash the item with the next regular laundry load. Repeat as necessary. Fabric softeners coat clothing, towels and laundry with a waxy residue that actually makes towels less absorbent. Add vinegar in place of fabric softener or 1/2 cup of baking soda to wash water to make the laundry soft and give it a fresh, clean smell without unnecessary chemical fragrances. Can Vinegar Rust a Washing Machine?